Mexican Rain Cape Thatch Panel Features: Versatile product; can be cut using scissors to any shape between the knots without unraveling. Kind of like cutting a fish net. 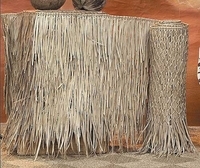 Specifications of Mexican Rain Cape Thatch: Hand-woven palm leaf sheet is for 48" H x 30' H x 1" thick and weigh 64 lbs each panel. Sold individually in one long thatch panel. Can measure up to 48" H x 32" W.
Fire retardants can also be applied on site to installed thatch structure but is not as effective as having us spray it for you. Mexican Rain Cape Thatch Dimensions: 48" H x 30' W x 1" thick. Each thatch panel provides 60 sq ft of coverage. Please allow material for overhang also when calculating thatched material.